The Greek parliament has voted in favor of a bill enacting the reforms required by its European creditors as part of a new bailout plan. 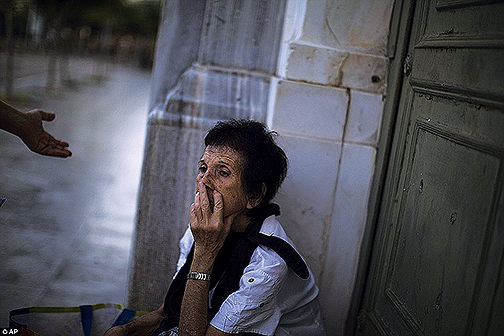 This paves the way for the controversial 85-billion-euro bailout deal defended by Prime Minister Alexis Tsipras. Parliament dramatically voted 'yes' to humiliating bailout terms which will see the country stay in the euro. Despite the success of a referendum in which the Greek people voted against a bailout agreement, Prime Minister Alexis Tsipras signed a new deal with creditors. 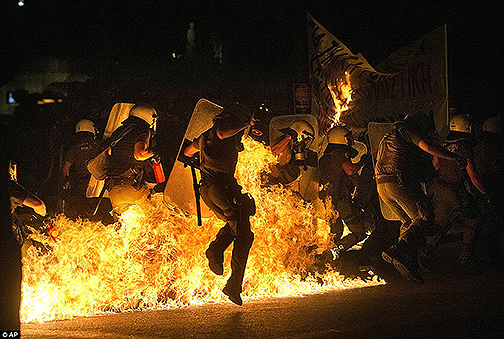 According to the terms of the bailout, Greece will receive €82-86 billion for three years. Last week German Finance Minister proposed a plan for an interim Grexit – from his point of view, Greece needed to leave the eurozone for five years to restructure its debt. Greece's parliament had been set a deadline of midnight local time (10pm BST) to pass a raft of measures including billions in cuts, VAT rises and pension reforms to secure the three-year bailout. However, that deadline passed, with ministers still locked in a heated debate about whether or not to adopt the reforms until 2am local time (12am BST). Ultimately the bailout terms were agreed after 229 of the country's 300 MPs backed the 'yes' vote. 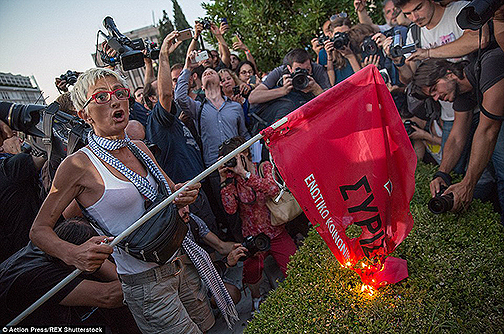 But it wasn't all good news for Prime Minister Alexis Tsipras as many of the 64 'nos' were members of his own party. In what was a bruising night for the country's leader, 32 of the 149 members of the radical left-wing Syriza rejected the measures. A government official has insisted that Tsipras will not resign despite the hit, although he had said he would step down if he did not gather the support of more than 121 of his Syriza MPs. He ended up with the support of 124. Former finance minister Yanis Varoufakis and house speaker Zoe Konstantopoulou were among the big names to vote 'no' to the reforms. Varoufakis, who quit his post last week, had earlier said the deal was a ‘new Versailles Treaty haunting Europe’, while Konstantopoulou called it a coup that could cause social genocide. On the eve of the deadline, it had looked increasingly likely that the parliament would approve the measures, in large part thanks to pro-European opposition parties. 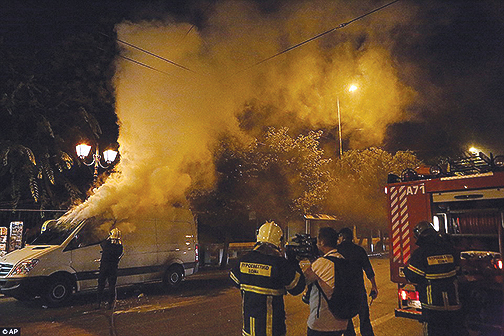 A TV broadcast van burns, demonstrating what the Greek people think of the "mainstream media"
But amid growing dissent among the Greek people, hundreds of armour-clad officers used pepper spray to fight back youths in a 12,000-strong crowd who were hurling Molotov cocktails and rocks at them. The youths had mingled with ordinary protesters when crowds gathered as MPs met last night to vote on austerity measures required for the latest European bailout. 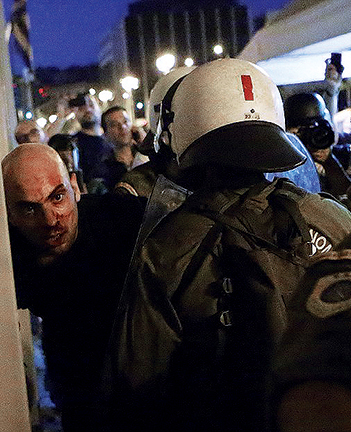 Many of the mask-wearing protesters carried wooden bats and pieces of smashed paving stones, in the worst clashes seen since Tsipras' left-wing government was formed six months ago. 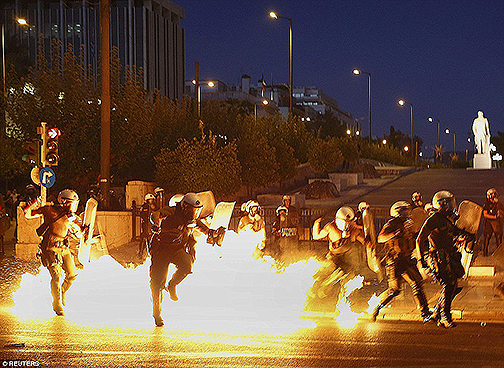 Police said about 50 protesters had been detained outside the parliament building. Inside, Tsipras made a final appeal to parliament for support of the tough package of bailout measures imposed by European partners this week, telling lawmakers there was no alternative, even though he disagreed with the measures. 'We don't believe in it, but we are forced to adopt it,' Tsipras told deputies before a vote on the measures, which had to be approved by parliament for European partners to agree to open talks on a new multibillion euro bailout. Politicians had gathered in Athens yesterday afternoon to debate the draconian reforms Tsipras agreed to implement during crunch overnight talks with eurozone leaders earlier this week. The harsh austerity measures Greece would have to put in place to release the bailout fund have been widely condemned, with even the International Monetary Fund branding them unfair. Earlier Tsipras revealed that even he does not believe in the tough bailout deal offered by eurozone leaders but said he only agreed to implement it in order to save the near-insolvent country, adding that he has no intention of resigning over the matter. 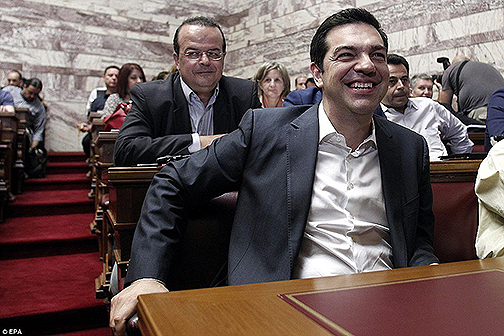 Defending the terms, Tsipras said the 'bad deal' was the best available under the circumstances. Tsipras also predicted that 'the great majority of Greek people' will support the deal, but admits he 'cannot say with certainty' that it will be enough to stop Greece exiting the eurozone - a so-called 'Grexit' - until the final bailout agreement is signed. The outcome of today's vote had been in doubt after the IMF issued its stark warning that Greece's creditors will have to go 'far beyond' existing estimates for debt relief to stabilise the country's finances. The deal has split the ruling radical Syriza party as it includes changes to labour laws, pensions, VAT and other taxes that were rejected by voters in a July 5 referendum. Tsipras' hard-pressed government suffered its first resignations yesterday afternoon, with a junior finance minister and a senior economy ministry official walking out in protest. 'I'm not going to vote for this amendment and this means I cannot stay in the government,' said junior finance minister Nadia Valavani. The parliament in Athens had to approve the deal before the 18 other eurozone leaders could start negotiations over what Greece is to get in return: a three-year bailout worth up to €86 billion, its third rescue programme in five years. 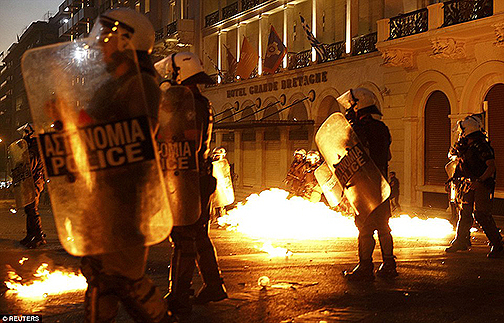 Yesterday afternoon it emerged that more than half of Syriza's central committee had signed a statement slamming the agreement Greece reached with its European creditors earlier this week, describing it as a coup against their nation by European leaders. Under the plan, eurozone governments will contribute between €40 and €50 billion, the IMF will contribute another chunk and the rest will come from selling off state assets and from financial markets, a European official said. This morning an independent United Nations expert on foreign debt says Greece's creditors may break international law if the austerity measures they demand lead to undue hardship. Juan Pablo Bohoslavsky says he is concerned about reported shortages of medicines and food caused partly by restrictions on money transfers. He says in a statement Wednesday that European institutions, the International Monetary Fund and the Greek government must ensure that any bailout deal safeguards the right to health care, food and social security. He is scheduled to visit Greece November 30 to December 7. The European Central Bank has been keeping Greek banks afloat with emergency liquidity, but it could be forced to cut off that aid if Greece misses a huge debt repayment due on Monday. European governments on Tuesday also clashed over options to help Greece meet its short-term cash needs while it waits for a eurozone bailout deal to be finalised, likely to take at least four weeks.